Memorial by M. L. Watson . The sculptor M. L. Watson was born in the vicinity of Carlisle, where he first studied to become a solicitor before going to London to train as an artist. On the advice of the famous sculptor Flaxman, he went first to the Royal Academy Schools, and later to Italy to study in Rome. He returned to England in 1828. He worked for Francis Chantrey, then Baily and Behnes, before setting up on his own. His career was cut off by his early death, from a recurrent heart problem. Unfortunately, because of his short life, we have relatively few works by M. L. Watson. 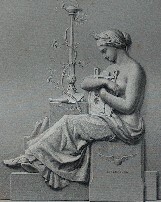 From what I have seen, he tended to classical figures and poses but with rather Victorian faces, and a simplified Greek style of draperies, often with straight-hanging robes in the style of Flaxman, or swirly cloaks and dresses of some light material which blows out in the wind or clings to the contours of the body. For his friezes, he uses a plain grounding with no sense of background or scenery, to keep the focus on his figures, and the sparse elegance of his composition. Watson's best known work was his panel The Battle of St Vincent for Nelson's Column in Trafalgar Square. 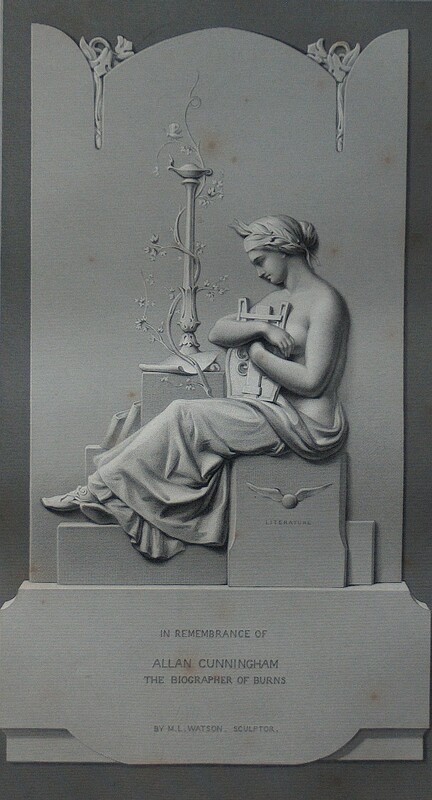 Among other work, we may mention a statue of Queen Elizabeth for the Royal Exchange, a Flaxman for University College London, and in Bristol, the pedimental sculpture for the Victoria Rooms (of which a small picture is on this page). A particularly good frieze was on Moxhall's Hall of Commerce in the City - the building is no more, but happily, the frieze is preserved in Napier Terrace, Islington (see the Islington page). Pediment sculpture, Victoria Rooms, Bristol.